When you hand out your business cards to existing or potential clients, you are leaving a lasting impression. 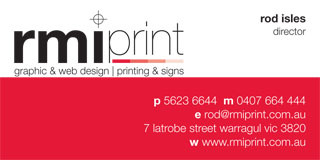 At RMI Print we understand that you deserve to be confident that your business card reflects the professionalism you wish to portray. If you are just starting up a business, we can start by designing your new business logo. Otherwise if you have a current card but are wanting a refresh, we’ll work with you to create something you are proud to show off to potential customers. We have been printing business cards for over 25 years using only the highest quality printers and the most trained press operators, meaning we can provide you with the best printing prices in the industry and a quick turnaround time. We are specialists at card printing. We can print your colour cards, black and white business cards, gloss laminated business cards, matt laminated business cards and so on. We print business cards of all shapes and sizes. Call us now and we can get you started today!